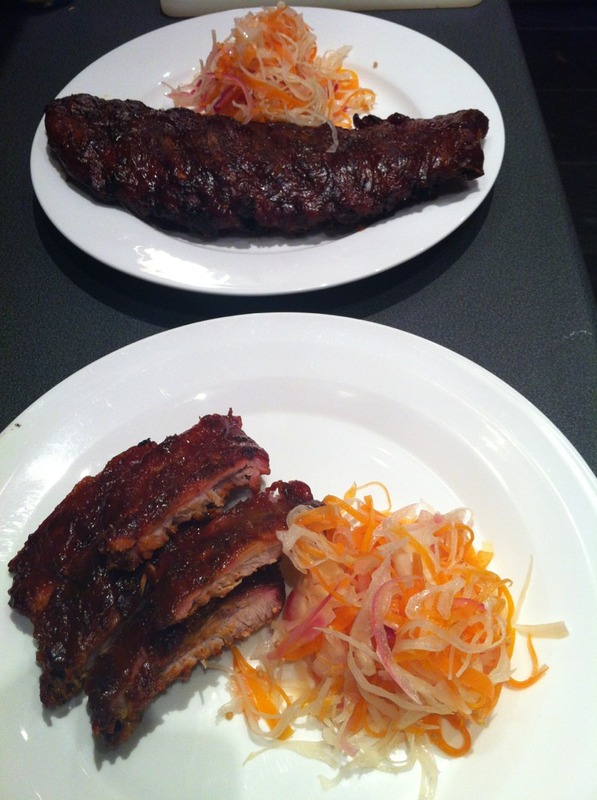 Keeping with the theme of using the blog as a place to store my notes, some brief jottings on a recent batch of pork ribs. Paste makes the rub wet so difficult to apply. Also it’s too hot for Hannah! Too much black pepper (or not ground enough). Smoke two hours over maple. Put in dish with apple juice and cook tightly covered in very low oven (110C) until done (meat tender but still on the bone). I tried this BBQ sauce recipe subbing liquid smoke for the smokey juices drained from the meat. This recipe has too much tomato ketchup in. Glaze the ribs in sauce and finish in hot oven. Putting the carrots, onion and cabbage in very well salted boiling water for five minutes, before draining improves the texture and flavour. Dressing is simply yellow mustard seeds and rice wine vinegar. Refrigeration before serving improves the flavour. Those Ribs look awesome! nice to see someone else doing some great smoked food.